Located just a few miles east of Missoula, MT, the Blackfoot River offers a variety of river experiences. From its source near Lincoln, MT the river meanders through Cottonwood groves and meadows. As it picks up volume and follows west the river flows through some spectacular canyons, fun whitewater sections, ending with a lazy meandering float to Bonner, MT popular with floaters on hot summer days. 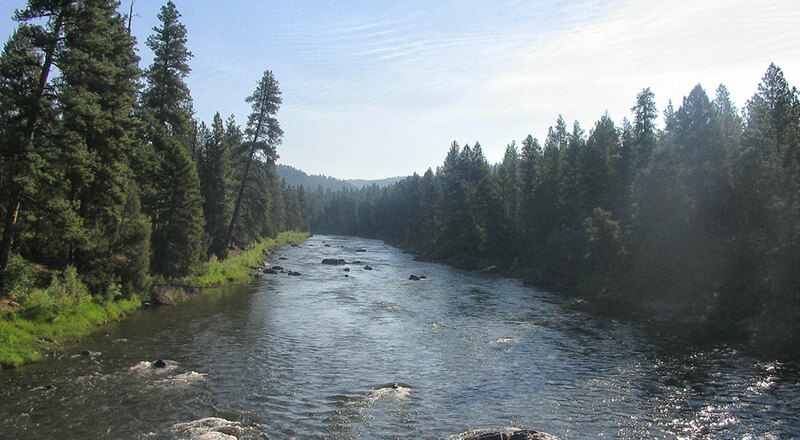 Bring the family, this river is appropriate for beginner paddlers and for those looking for a scenic trip with a little whitewater. The optimal time for Class II-III whitewater on the Blackfoot is during spring run-off in May & June. Being a smaller tributary of the Clark Fork, this can be a better option when the Clark Fork’s Alberton Gorge is running too high. For bigger more extreme whitewater, the best choice would be the Lochsa River. In Sept of 1805 while at Travellers Rest (Lolo, MT) they learn from the Native Americans of a route to the plains of the buffalo only 4 days travel yet they spent 52 days following the Missouri to its headwaters, over Lemhi Pass, down the Salmon River, then over Lost Trail Pass and down the Bitterroot River. During the winter at Fort Clatsop Lewis & Clark had decided that when they returned to Travellers Rest they would divide and party in order to make two explorations which they had not made on the westward journey. Lewis is to traverse the route to the Great Falls which they are sure is shorter and better than the once the took westbound. He will go up the Blackfoot River, cross the divide, then on to the Great Falls. Since the removal of the Milltown Dam (Built in 1906 by copper king William A. Clark) it will once again be possible to navigate the Blackfoot to the Clark Fork River and into Missoula, MT. Read more about this process. The Native Americans called the Blackfoot River “cokalahishkit” meaning river of the road to the buffalo and the valley was guarded by the Blackfoot Indians. Tribes would follow the river to its headwaters over the continental divide and out to the prairie grass lands of the Buffalo near present-day Great Falls. We think one of the most beautiful drives in the state is on Hwy 200 following this route from the Blackfoot River canyons to the expanse of the Rocky Mountain Front. The workshop’s title, “Body of Water / Body of Work,” alludes to Dombrowski’s brilliant 2016 work of nonfiction, Body of Water. We will consider rivers as hydrological illustrations of our own lives and work. We will explore time as it occurs on a river; the interconnectedness of water, landscape, and humanity; and the related notions of influence and confluence. Blackfoot trips usually depart from our office at 912 E. Broadway, Missoula MT, we can also meet you at the one of the river take-outs (Blackfoot River flows westward towards Missoula) or custom pick up location can be arranged for large groups. Return times are estimations and depend on water level, allow for delays. Minimum age limit varies according to water level. Summer levels 6 yrs old. The start of our Blackfoot Trips depends on the river flow, the takeout is at Johnsrud Park.